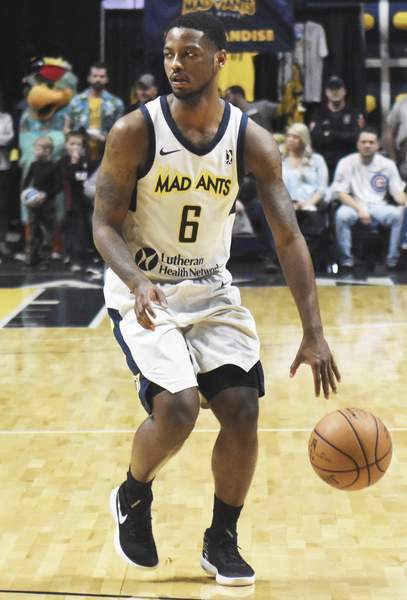 Rachel Von | The Journal Gazette Mad Ants' Tra-Deon Hollins dribbles the ball down the court during the second quarter of the game against Iowa Wolves at the Memorial Coliseum on Sunday. Rachel Von | The Journal Gazette Mad Ants' Tra-Deon Hollins, left, tries to find an opening around Iowa's Anthony Brown during the second quarter of the game against Iowa Wolves at the Memorial Coliseum on Sunday. 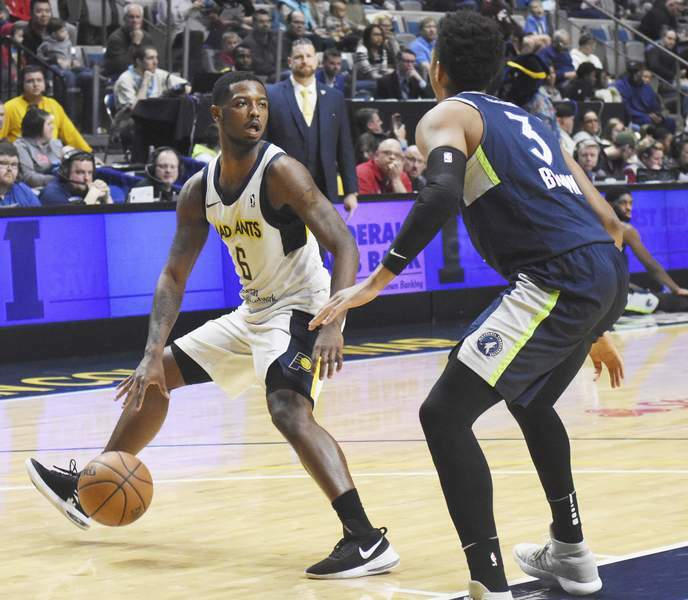 We can talk about DeQuan Jones’ 40 points – he’s only the second Mad Ants player since 2013 to do it (Walt Lemon Jr. was the other) – and it was of course the most important part of the Mad Ants’ 103-89 victory today over the Iowa Wolves. But this may be far more interesting: Rookie Tra-Deon Hollins, who a year ago was facing the likes of IPFW in the Summit League, and who just took over the starting point guard job last week because Lemon and Trey McKinney Jones were called to the NBA, had one of the wildest statistical nights anyone around here could remember. Hollins had 0 points, 14 assists and 10 steals over 42:38. That’s right, a double-double with no points. Video of Hollins' game is above. Hollins wasn’t available for comment because his name came up for the G League’s random drug testing protocol, but his teammates were more than happy to rave about a guy they’ve said all season long was capable of great things. The Mad Ants drafted Hollins from Omaha in large part because of his defensive abilities and they consulted with IPFW coach Jon Coffman, who gave rave reviews.